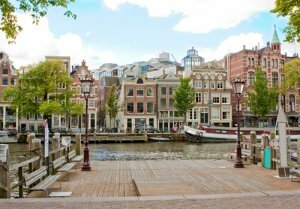 Royal Hotel, Dam Square: Amsterdam caters for all tastes, and visitors are spoilt for choice with museums, galleries, canals, parks and canals, so starting centrally is a good idea. The Amsterdam Het Paleis on Dam Square is one of three used by the monarch. Originally built as the town hall in the seventeenth century, it later become the royal residence for firstly King Louis Napoleon, and then the Dutch Royal Family. The Palace still hosts state events, but is open to the public for most of the year, with guided tours and audio tours available. The principle architect was Jacob van Campen, and Pieter de Hooch painted a series of canvases depicting the interiors around 1660. At the rear, a six-metre-tall statue of Atlas complete with globe emphasises the international influence of the Dutch in the seventeenth century. While you’re in the central area, check out the Museum Het Rembrandthuis at Jodenbreestraat 4, which was the painter’s home and studio for twenty years. The seventeenth-century interior has been renovated and returned to its original state, and now displays works of art and etchings by the master. Rembrandt is buried in the churchyard of Westerkerk, probably along its northern wall. It translates as Western Church and was one of the first erected specifically for Protestants. Standing on the banks of the Prinsengracht close to the Jordaan district, with a tram stop right outside, this seventeenth-century building is the largest of its type in Amsterdam. The diarist Anne Frank mentions Westerkerk several times. She could see the bell tower from her attic hiding-place, and found peace in the ringing of the bells. A statue outside the church remembers her, while at the nearby house, you’ll discover how this young Jewish girl filled her time here until discovered by the Nazis during the Second World War. Head out from the centre to lively Leidseplein Square with its bars and nightlife. It’s just a ten-minute tram ride from Central Station, and you’ll find plenty of choice of reasonably-priced accommodation, such as the Amsterdam Hostel Uptown.